In what may possibly be the most unsettling candle holder ever made, and something that on Halloween is definitely more trick than treat, this Stranger Things-inspired Eleven Bleeding Nose Candle from Firebox is both ingenious and down right super creep. 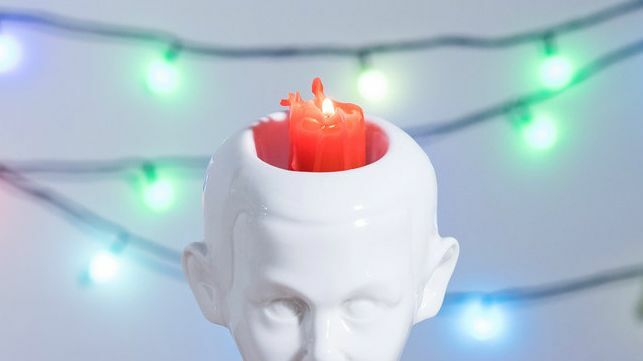 Dubbed by Firebox itself as "the strangest thing we've ever created" the red candle, once lighted, proceeds to melt and then bleed out of both nostrils, with the bloody goo pitter-pattering onto the surface below (placing the holder on a board or plate will be essential). Check out the gif below of Eleven in action. Just perfect we're sure you'll agree for El-luminating that impending Stranger Things 2 binge or as an eye-catching mantelpiece mainstay during the incoming cold, dark, winter months. And eye-catching it will be thanks not only to the whole bleeding nose dead eyes thing, but also due to its bumper dimensions, with Eleven measuring in at 21cm(W) x 26cm(H) x 16cm(D). As well as the Eleven candle holder itself, which is made from smooth white ceramic, buyers also receive a nose picker for post-bleed cleaning, as well as two large red candles to burn. For those who are turned on by such ghoulishness, the Eleven Bleeding Nose Candle is available to pre-order now for £29.99 from Firebox's official website.